The Echinoblog: Know your Grades of Uni! So, I recently discovered that there was a California Sea Urchin Commission, complete with their own very interesting website. 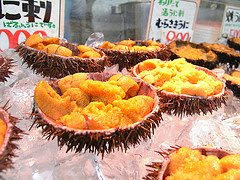 And here are Uni's Nutritional Facts! Uni's so pretty, and yet it tastes like dirt to me. Sadness, particularly since there's a fishery right here in San Diego. Well, not everyone takes to it. I liken it to the 'deep end' of the pool when learning how to swim. And even if you get to that point, you might not like it. And as the grades indicate-your uni may vary with where and how you get it. I have been told the yellow and light colors are hard to read in an RSS feed. I will try to find more middle-ground colors!